A complete redesign of the Quest Partners, LLC site and brand. Quest wanted to evolve beyond the same old look and update their identity. Came up with "Mindfulness Meets Mathematics" slogan. Shining a spotlight on the Manager's meditation discipline hit a home run with the media, driving awareness and site hits. Defined the competitive advantage, in a single glance. Turned complex concepts into four understandable categories, paired with a custom icon set to support the brand language and elevate audience delight. The rebrand supported marketing efforts and convinced the market that recognition was deserved. The firm was subsequently named "Best Management Firm of the Year." 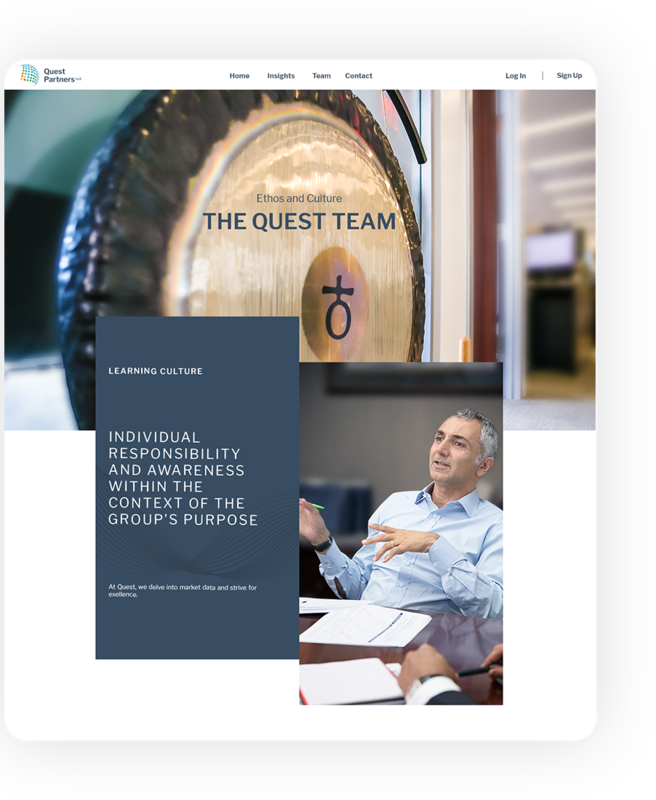 A values centered glimpse into the organization unfolds a story people want to hear. Transformed a dull site into one of interest by emphasizing a culture that convenes around purpose to showcase one of the world's leading investment teams.